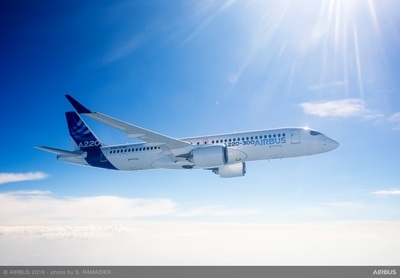 Mobile, Alabama, USA - January 16, 2019 - Airbus' manufacturing growth in the United States advanced another step today in Mobile, Alabama, as construction of the company's A220 Manufacturing Facility officially launched with a groundbreaking ceremony. The assembly line will satisfy the strong and growing U.S. demand for the A220 aircraft, the newest offering in Airbus' commercial aircraft product line. Airbus’ manufacturing growth in the United States advanced another step today in Mobile, Alabama, as construction of the company’s A220 Manufacturing Facility officially launched with a groundbreaking ceremony. The assembly line will satisfy the strong and growing U.S. demand for the A220 aircraft, the newest offering in Airbus’ commercial aircraft product line. Tom Enders, CEO of Airbus, and Guillaume Faury, President Airbus Commercial Aircraft led the celebration and welcomed approximately 700 attendees including Airbus and other industry executives, Airbus manufacturing employees, state and national dignitaries, and local community leaders. A220 Manufacturing Facility officially launched with a groundbreaking ceremony. Airbus A220 Groundbreaking Event - Mobile, Alabama, USA. The new assembly line, which is the company’s second U.S.-based commercial aircraft production facility, will be located at the Mobile Aeroplex at Brookley adjacent to the A320 Family production line and will facilitate assembly of A220-100 and A220-300 aircraft for U.S. customers. 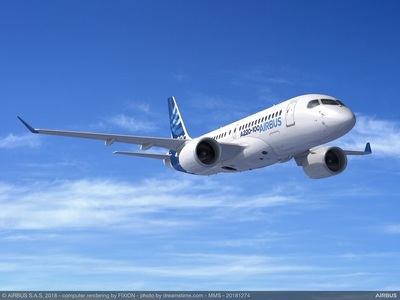 Aircraft production is planned to begin in Q3 2019; with first delivery of a Mobile-assembled A220 aircraft scheduled for 2020. The new A220 production facilities will be complete by next year. Tom Enders, CEO of Airbus, at Airbus A220 Groundbreaking Event - Mobile, Alabama, USA. Airbus has strong and longstanding ties to the United States, with Airbus aircraft being operated by the largest airlines in America. Additionally, Airbus is a major partner of U.S. aerospace companies and workers. In the last three years, Airbus spent $48 billion in the United States with hundreds of U.S. suppliers in more than 40 states, translating into Airbus support of more than 275,000 American jobs. • a satellite manufacturing facility (OneWeb) in Florida. Mobile, Alabama Governor Kay Ivey at Airbus A220 Groundbreaking Event. The A220 is the only aircraft purpose-built for the 100-150 seat market; it delivers unbeatable fuel efficiency and true widebody comfort in a single-aisle aircraft. The A220 brings together state-of-the-art aerodynamics, advanced materials and Pratt & Whitney’s latest-generation PW1500G geared turbofan engines to offer at least 20 percent lower fuel burn per seat compared to previous generation aircraft. Guillaume Faury, President Airbus Commercial Aircraft, at Airbus A220 Groundbreaking Event - Mobile, Alabama, USA. With a range of up to 3,200 nm (5920 km), the A220 offers the performance of larger single-aisle aircraft. In 2017 it generated revenues of €59 billion restated for IFRS 15 and employed a workforce of around 129,000.